The University of Maine at Presque Isle’s Reed Fine Art Gallery will present Crafted: Fine Craft of Northern Maine, curated by UMPI Assistant Professor of Fine Art Hyrum Benson. The exhibition opens Dec. 3 and runs through Jan. 5, 2013. The public is invited to join the curator and featured artists for an opening reception on Dec. 7 from 5 to 7 p.m., which is being held in conjunction with the First Friday Art Walk. Crafted honors excellence in Fine Craft being produced here in northern Maine. Benson, who also serves as the Regional Coordinator of the Maine Craft Association, has selected to feature the works of Terry Kelly, furniture maker; Edith Greiner, weaver and fibers artist; Heather Bessey, potter; Jeremy Frey, basket maker; Russell Mount, wood carver; and Mary Sanipass, basket maker. 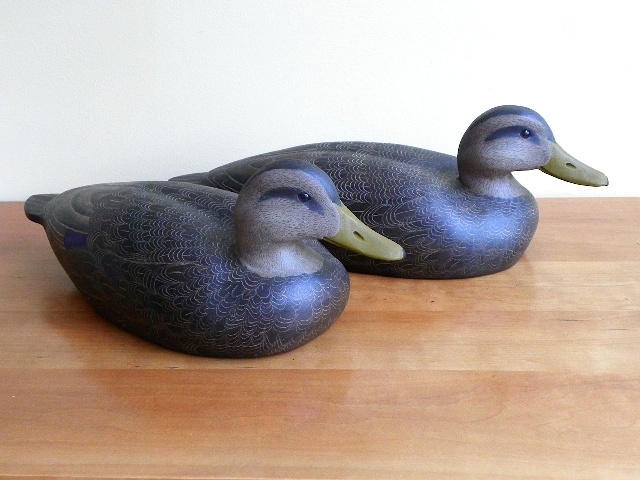 Russell Mount merges his love for bird watching with the creation of bird decoys and, furthermore, his “cigar birds” which are featured in the Reed. 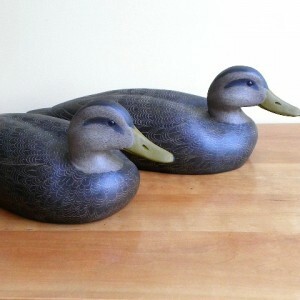 Mount, of Castle Hill, has been carving decoys for many years and has had his works on display around the country. Mount cites the rural setting as a powerful influence in his work. Heather Bessey, potter, has had a 40-year interest in clay. She states, “In 1972, I began my journey in clay. I was studying chemistry when someone passing by saw my chemistry book and asked if I could help with a glaze formulation. He owned an old barn, four kick wheels and a gas kiln. Having grown up digging clay from the bottom of the lake and air drying my creations, I was intrigued. In no time, I was hooked on clay.” Bessey now has her own studio in Ashland where she creates her work. Mapleton artist Terry Kelly has been making furniture for 12 years. He is self-taught and has quickly become a rising star in the Maine craft community. His most recent piece is a commission for the Farnsworth Museum in Rockland. His Farnsworth bench will debut in the Reed exhibition before it is permanently placed at the Farnsworth Museum. Kelly’s bench is not the only debut that will be featured in the exhibition. A basket made by Jeremy Frey, award winning Passamaquoddy community member, is UMPI’s most recent acquisition. Acquired in honor of the service of recent UMPI President Donald Zillman and his wife, Linda, the basket will be a keystone of the exhibition before it makes its way to a permanent display on campus. Frey is a United States Artist Fellow. The highly prestigious $50,000 award is given for the caliber and impact of the selected artist’s work. Frey is widely regarded as one of the leading basket makers in the nation. Edith Greiner, art teacher for MSAD 20 in Fort Fairfield, recently celebrated 40 years of weaving in Aroostook County. She did her first weaving when she was in kindergarten and built her first loom in the closet of her Philadelphia flat during her years as a student at Tyler School of Fine Arts. Since then, she has filled her studio with five looms and has woven everything from recycled denim rugs to wearable pieces made with luxury fibers, such as silk, mohair and alpaca. Mary Sanipass is a nationally acclaimed basket maker and photographer. Her work has been shown in the Smithsonian Institute and the Heard Museum in Phoenix. She and her husband Donald, who passed away in 2007, were subjects in the 1985 national documentary film Our Lives in Our Hands, which examines the traditional Native American craft of split ash basket making as a means of economic and cultural survival. In 2004, they were honored with a Community Spirit Award by the First People’s Fund, a national nonprofit organization committed to supporting the creative work of American Indian artists. Crafted: an Exhibition of Fine Craft in Northern Maine will have an Opening Reception Dec. 7 from 5-7 p.m. The artists will be present for a short gallery talk at 5:30 p.m. The reception is free and open to the public. Light refreshments will be served. The Reed Fine Art Gallery is open Monday through Saturday 9 a.m. to 4 p.m. The gallery is closed Sundays and University holidays. For more information about this event, please contact Sincavage at 768-9442 or heather.sincavage@maine.edu.